The importance of solar forcing on climate has now been recognized. However, the atmospheric solar signal and its transfer mechanism(s) remain still uncertain. To address these questions, the international working group SOLARIS (in 2012 renamed to SOLARIS-HEPPA) was created to clarify the effects of solar influence on climate with special focus on the importance of middle atmosphere chemical and dynamical processes and their coupling to the Earth's surface with state-of-the art chemistry-climate models (CCMs) as well as mechanistic models and observations. We foster and initiate detailed studies on the "top-down" solar UV and the "bottom-up" TSI mechanisms, as well as on the impact of high-energy particles. In addition, SOLARIS-HEPPA aims to provide a platform for the coordination and discussion of solar-related studies. 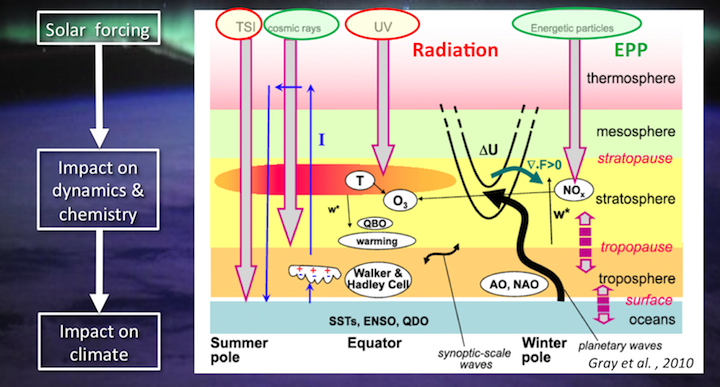 This includes recommendations for the solar irradiance and particle-related data (proton fluxes and geomagnetic proxies) used to drive middle atmosphere and climate models within e.g. the SPARC-CCMVal/CCMI initiative and the CMIP5 simulations. The SOLARIS-HEPPA activity is an extension of the GRIPS solar influence inter-comparison (Matthes et al., 2003; Kodera et al., 2003). Recently SOLARIS has been joined with HEPPA (High Energy Particle Precipitation in the Atmosphere), which brings together scientists involved in atmospheric modelling using state-of-the art CCMs and CTMs on one hand, and scientists involved in the analysis and generation of satellite data on the other hand. SOLARIS-HEPPA collaborates with a number of other programms and groups such as the initiatives SPARC CCMVal, SPARC DynVar, the EU COST project: "Towards a sounder assessment of the impact of solar variability on the Earth's climate", as well as Task 1 of the programme SCOSTEP CAWSES II (Climate and Weather of the Sun-Earth System). The joined SOLARIS-HEPPA initiative will give a more complete picture of „Solar Influence on Climate“ and will enhance the initiative’s visibility. A joined goal is a recommendation for the next IPCC round which processes (solar radiation and particles) to include in future climate studies.